Dede describes his company as “the Swiss Army knife” of graphics’ companies. When it comes to creating cut-out lettering, stand-up displays, signs and logos, Dede turns to the rigid substrate that he’s trusted for years – heavy-duty Gatorfoam® graphic display board. Gatorfoam consists of polystyrene foam bonded between two layers of wood-fiber veneer laminate – a unique construction that makes this substrate rigid yet lightweight and warp-resistant; its surface also is exceptionally smooth and strong, offering superior dent- and scratch-resistance. Gatorfoam is available in thicknesses ranging from 3/16 inches to 2 inches and in standard sizes ranging from 48-by-96-inch sheets to 96-by120-inch sheets. Gatorfoam color combinations feature Bright White, Black and Natural facers bonded to either white or black foam. Metro Signs often creates multi-layered signs with built-out dimensional lettering. Often, Metro Signs will utilize ½-inch Gatorfoam as a back plate then add ½-inch raised Gatorfoam letters. Dede said he prefers black Gatorfoam for most lettering but chooses white Gatorfoam to complement gold lettering. Metro Signs outsources projects that require CNC cutting. But many Gatorfoam logo and lettering projects featuring intricate designs are hand-cut by Metro Signs’ employees with a scroll saw or jigsaw. “There are times when we use Gatorfoam that we just cut and go,” said Dede. Some Gatorfoam projects at Metro Signs feature printed vinyl graphics applied with silicone and double-sided tape. The layers are screwed together on-site. Some signage projects are screwed directly to walls on-site. 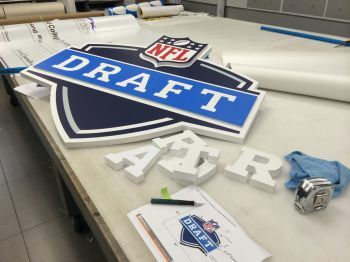 Others – such as new Miami Dolphins’ logos created by Metro Signs with Gatorfoam for the NFL team’s training facility – are adhered to walls with silicone and double-sided tape. “We like using Gatorfoam when we’re hand-cutting or using a jigsaw. … When we cut Gatorfoam, it never delaminates,” said Dede. 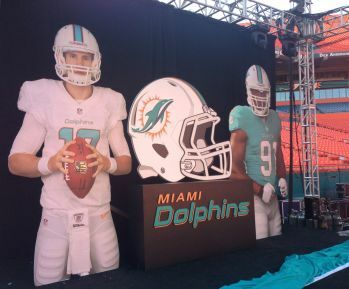 When the Miami Dolphins unveiled the team’s new logo design and uniforms at an April 2013 NFL draft party at Sun Life Stadium, Metro Signs created a larger-than-life stage backdrop featuring two self-standing 16-foot-tall uniformed player images printed on vinyl and matte-laminated to 1-inch thick Gatorfoam that was hand-cut with a jigsaw. Separate helmet images were mounted to ½-inch Gatorfoam as a dimensional layer for the player standees, which were positioned on either side of a black wooden box decorated with lettering hand-cut from 1-inch-thick Gatorfoam. 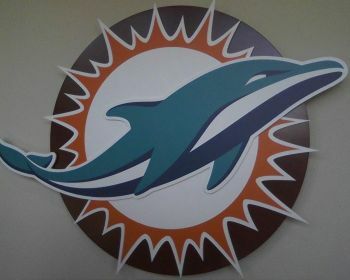 Positioned atop the wooden box was a Dolphins’ helmet image that was printed on vinyl, laminated to 1-inch-thick Gatorfoam and hand-cut with a jigsaw.